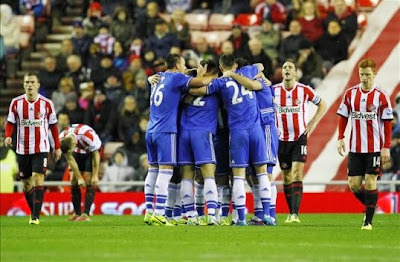 Sunderland 3-4 Chelsea: Your reactions to a massive three points! Chelsea beat Sunderland 4-3 tonight with a fine display from Eden Hazard scoring two and assisting another and we take a massive three points following on from three points against Southampton last weekend! Right now, with games coming thick and fast, I personally don't care about the level of performance from Chelsea. All I care about is a Chelsea win and three important points! Yes, we made life difficult for ourselves. Yes some of our defending left alot to be desired and yes we should have taken at least two or three more chances to kill the game off but we dug in when we needed to and held firm tonight in the closing minutes. Eden Hazard was on another planet tonight and bossed the game. Every time he had the ball at his feet, Sunderland were too scared to tackle him and the fact that he cut inside from left to right TWICE, avoiding tackles and scored shows the class he has. In addition to his two goals, Hazard beat the defenders all ends up again, cut back onto his right foot and floated a fantastic cross into the path of Frank Lampard who headed home from close range. Hazard was man of the match without question and after a performance like that, Jose Mourinho and his medical staff need to do all they can to keep him fit if we are to sustain a real title challenge. Chelsea had made it 4-2 with an own goal from Bardsley late on but then allowed him to score up the other end a short time later to give us all the jitters with a couple of minutes to go. Chelsea held out and took a massive three points! What did you people think of the game?